Benjamin Ellefson is a prepper who writes children’s books with themes of preparedness and survivalism. He is the author of the award-winning book The Land without Color and its upcoming sequel The Great Sugar War. I recently had the opportunity to sit down with Benjamin and ask him a few questions. How did you get involved in prepping? I always loved the outdoors as a child. Some of my favorite memories were running through the woods at summer camp and canoeing down the Brule river in north Minnesota. Fiction for younger readers with a Prepping message. When I grew up, I got distracted with the corporate world of making money to provide for my wife and four young daughters. But when I experienced my first disaster in life when I got divorced, I returned to my love of the outdoors to cope. That is when I discovered the prepping and survival community online. Still in the midst of my personal disaster, I instantly identified and understood the need for disaster preparedness. I started my food storage, every day carry, and research into learning new survival skills. What motivates you as a prepper? The economy. In my research learning about preparedness, I discovered the horror that is The Federal Reserve. And how the economy is a house of cards waiting to fall over with the slightest tremor. Ever since then, I keep a keen eye on the economy and politics trying to anticipate impending disasters. And everything I see this election cycle does not make me optimistic. The other thing that motivates me are my daughters. As a father, I have the awesome responsibility to care for and raise four beautiful girls. Making sure they stay safe and healthy through any disaster is my top priority. While I am ensuring I have plenty of preps for them, I love to teach them how to be self-reliant and self-sufficient. What do you think the most important aspect of prepping is? I think the most important aspect of prepping is being mentally prepared. Most people in society are sheeple caught up in normalcy bias. They are asleep thinking nothing bad can ever happen. Or if something bad does happen, that government will just come and fix it. These are the people who will be frozen in shock when a true disaster hits. Not only have they not gathered any preps ahead of time, but they not act in the beginning of any disaster because of their confidence for everything to just be OK. 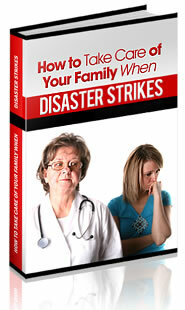 Being aware of potential disasters and mentally prepared give you a leg up whenever anything goes wrong. Not only will this naturally lead to storing preps and learning skills ahead of time, but it will prevent the deer in the headlights reaction when it truly counts. What is your favorite prepper novel? Lights Out by HalfFast. It is an amazing novel the follows a family and neighborhood during a nationwide EMP strike and the aftermath. I loved the character and the evolution of events and non-preppers wake up to the disaster and fight to survive. The story is realistic and has plenty of page-turning excitement. When did you begin writing stories with prepping themes? I started writing back in 2012 after watching the documentary The Secret of Oz. It is an amazing movie about the symbolism behind the classic book The Wizard of Oz. I had seen the movie so many times, but never realized the deeper messages behind it. This inspired me and my head started filling with fantasy ideas incorporating all of the prepping ideas that I was learning at the time. Soon I had an outline and a rough draft. Ever since then, I’ve been a writing maniac. Why do you write children’s stories? I love fantasy adventures. As a father of four daughters, I was disappointed to find that most survival or prepping themed books were geared towards adults. So I decided to write novels that could be consumed by and loved by young children. But at the same time be universal in their appeal with greater ideas and subtle messages that would be enjoyed by adults. The Wizard of Oz and the Phantom Tollbooth were my templates and greatest influences in writing my first novel The Land without Color. It worked so well that I used the template I created in that book for its two sequels. What are some of the prepping themes in your novel? The Land without Color is filled with many prepping themes. The story followed Alvin as he gets a pocketknife for his birthday. As he sets out on an adventure in a fantastic, colorless world, he uses his every day carry pocketknife to escape from many situations. His sidekick is a squirrel named Permy who has a vast array of preps buried around the kingdom in little acorn pails. This reinforces the importance and idea of storing food and items. There any many other themes and ideas that any prepper will love, but I won’t spoil them all now. Do you have any additional novels in the works? I do. The Land without Color is the first in a trilogy. The second book The Great Sugar War is finished and almost ready for print. I’ve got a Kickstarter campaign that is live now where people can pre-order the book for less than the retail price with free shipping. The Great Sugar War will be out in early December. The third book in the series is written and currently being illustrated. It should be available in December 2017. I have also started writing a new seven-book series filled with preparedness themes. I am very excited about it and think it will be well received. Where can prepper readers find you? The best place to find me is on my author website http://www.benjaminellefson.com. I frequently post updates and news about signings and appearances. To stay I touch, you can sign up for my mailing list to keep in the loop on the latest news. I am also active on Facebook, Twitter, Pinterest, and Goodreads. The post Interview with Prepper Children’s Author Benjamin Ellefson appeared first on The Prepper Journal.